Using the Face Data function, you are able to select a point on a face and then extract entities from it. One or more of the following can be created: a point, a normal vector, a tangent vector, a cross vector, a tangent plane, and a U or a V direction flowline. These entities are modeled as stand-alone entities and are not part of the solid body. Select Face Data from the Tools>Extract submenu. 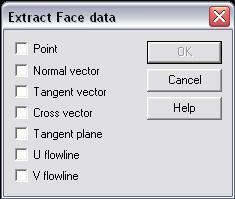 The Extract Face Data dialog box appears (see below), through which you are able to specify what entities to extract from the available options: Point, Normal Vector, Tangent Vector, Cross Vector, Tangent Plane, U Flowline, and V Flowline. Select the face and follow the prompts specific to whatever entity type you had indicated in the Extract Face Data dialog. Specify which data types to extract from the face. The following options are available: Point, Normal Vector, Tangent Vector, Cross Vector, Tangent Plane, U Flowline, and V Flowline.